Select the container type and quantity required in the form at the end of the page. Simply fill the containers and call us to arrange a convenient date for collection. For a continual service a replacement container can be deposited with you at this time. If you are a large scale waste producer and have a regular need for recycling, we offer you a FREE RECYCLING service for three of our products (FS01, FS02 & FS03). There are significant savings to be made this way. Simply fill the containers (to at least 65% full) and call us to arrange a convenient date for collection. For a continual service a replacement container will be deposited with you on collection of your full container. To enable us to offer the 'FREE' or ‘DISCOUNTED’ fluorescent tube recycling service under the 'WEEE' compliance scheme, we will require you to simply confirm that you are using our services to dispose of your redundant fluorescent tubes. Please click through to the word template and add information and details required on company headed paper. Should you have any questions regarding this, please contact our sales office for clarification. FREE Hazardous Waste Consignment Notes included in price. 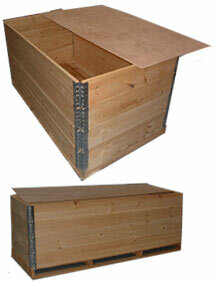 Flu-Store pallet boxes are constructed from timber pallets and robust stacking collars. These easily assembled boxes provide an environmentally friendly solution for safe and reliable handling of used lamps in storage and in transit. With the pallet collars secured in place, fluorescent tubes and lamps are well protected against accidental damage. When packing or unpacking, it is easy to add or remove individual collars to achieve the working height required. Only first quality Swedish raw materials are used in the construction of ‘Flu-Store’ Pallet Boxes. 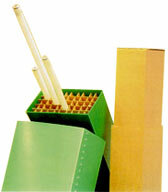 Our telescopic cartons are supplied with internal division sets to accommodate up to 50 tubes 6' - 8' in length. Full recycling of all redundant lamps and fluorescent tubes in accordance with the “Hazardous Waste Regulations 2005"
Select the container type and quantity required in the form below. Enquiry Fluorescent tubes in their original packaging can be collected by arrangement P.O.A.